Frontiers and Advances in Molecular Spectroscopy once again brings together the most eminent scientists from around the world to describe their work at the cutting-edge of molecular spectroscopy. Much of what we know about atoms, molecules and the nature of matter has been obtained using spectroscopy over the last one hundred years or so. 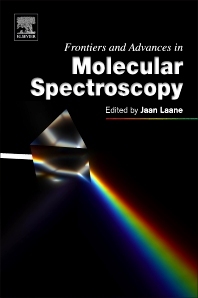 Going far beyond the topics discussed in Jaan Laane’s earlier book on the subject, these chapters describe new methodologies and applications, instrumental developments and theory, which are taking spectroscopy into still new frontiers. The robust range of topics once again demonstrates the wide utility of spectroscopic techniques. New topics include ultrafast spectroscopy of the transition state, SERS/far-uv spectroscopy, femtosecond coherent anti-Stokes Raman spectroscopy, high-resolution laser induced fluorescence spectroscopy, Raman spectroscopy and biosensors, vibrational optical activity, ultrafast two-dimensional spectroscopy, biology with x-ray lasers, isomerization dynamics and hydrogen bonding, single molecule imaging, spectra of intermediates, matrix isolation spectroscopy and more. Jaan Laane graduated high school as class valedictorian and then attended the University of Illinois as a Sloan Scholar and James Scholar. He graduated with Highest Distinction in Chemistry in 1964 receiving the Kendall Award as the top chemistry major. He then carried out graduate work at MIT with Richard C. Lord as a National Science Foundation and Woodrow Wilson Fellow, receiving his Ph.D. and the Kodak Award as the top graduate student in 1967. Following a year at Tufts University, Jaan moved to Texas A&M University where he soon was promoted to Full Professor (1976). His research focused on the determination of vibrational potential energy surfaces in both ground and excited electronic states. He has contributed to the theoretical understanding of molecular vibrations and structures and to the experimental methodology in these areas. He has more than 300 publications and three books. He has been in the forefront of writing computer programs for analyzing potential energy surfaces. These have been widely distributed and utilized. Laane has supervised the research of more than 40 Ph.D. students, 60 undergraduates, and dozens of post-docs and visiting professors. He has received the Humboldt Award, a Texas A&M teaching award and the Lippincott Award among others. He was Chair of the Physical and Nuclear Chemistry Division for many years and Associate Dean of Science and Speaker of the Faculty Senate. Since 1994, Laane has been Editor for the Journal of Molecular Structure.